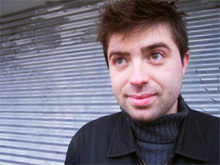 Roddy Schrock is a California-based digital composer. A mercurial presence in the new music scene for nearly ten years, his live performances, music and installations have been presented in Japan, Europe and North America. His music juxtaposes playful sonic surfaces and formalism, rooted in frivolity. He is a recognized electronic music artist. His performances and installations have taken him around the globe multiple times. 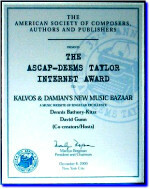 His work in software design has been used by award-winning composers. As an educator he has taught at STEIM, De Anza College, and currently CSMA. He is a regular contributor to New Music Box and has also written for e/i magazine, and Gridskipper. He received his MFA from Mills College and completed a certificate program in Sonology at the Royal Conservatory of the Hague in the Netherlands. 2007, Freddie Herko Memorial Evocation, collaboration with Deric Carner, Artists’ Television Access, San Francisco. Royal Conservatory of the Hague, Certificate: Sonology, The Hague, Netherlands, 2004. Mills College, M.F.A., Electronic Music and Recording Media, 2003. Mississippi State University, B.A., Sociology, 1999.